Father, through St. Romuald you renewed the life of solitude and prayer in your Church. By our self-denial as we follow Christ bring us the joy of heaven. We ask this through our Lord Jesus Christ, your Son, who lives and reigns with you and the Holy Spirit, one God, for ever and ever. Amen. 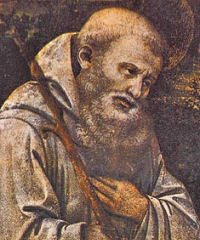 St. Romuald was born in Ravenna of a noble family. Founder of the Camaldolese monks — one of the Italian branches of the Benedictines — in which the eremitical life is combined with life in community. He died in 1027, after a life of prayer and rigorous penance. In the Extraordinary Form his feast is celebrated on February 9. According to the 1962 Missal of Bl. John XXIII the Extraordinary Form of the Roman Rite, today is the feast of St. Juliana of Falconieri who was born in Florence in 1270. She was about fifteen when, at the end of 1284, St. Philip Benizi, General of the Servite Order, received her among the Mantellatae, the female branch of the Order. She had a great devotion to the Holy Eucharist and practiced to a rare degree the Servite devotion to the Sorrows of our Lady. She died in Florence in 1341. Today is also the commemoration of Sts. Gervase and Protase who were martyred at Milan in the second century. St. Ambrose discovered their bodies in 386. They rest now, with the body of St. Ambrose himself on the altar of the crypt of St. Ambrose church at Milan. They are invoked in the Litany of the Saints. Romuald's was one of the strictest orders for men in the West (a branch of the Benedictine Order). Members live isolated in small huts, observing strict silence and perpetual fasting, constantly praying or engaged in manual labor. Our saint enjoyed the grace of bringing sinners, particularly those of rank and power, back to God. When he died, he was a little over seventy years; he had never used a bed, had always sought out ways of practicing severe penances. 15 years later his pupil, the holy doctor of the Church, St. Peter Damian, wrote his biography. "His greatness lies in the rigorous and austere character of his interpretation of monastic life-an approach that was quite singular and unique. In the deepest recesses of his being, Romuald was an ascetic, a monk; not perhaps, a monk of that serene peace and self-possession exemplified by St. Benedict in his life and described by him in his Rule. Nor was Romuald an organizer who through prudent legislation enabled his spirit to flourish and affect great numbers. He reminds us of the stolid figures inhabiting the Eastern deserts, men who by most rigorous mortification and severest self-inflicted penances gave a wanton world a living example of recollection and contemplation. Their very lives constituted the most powerful sermon. It is in company with men like these that St. Romuald continues to live." Romuald was not at all a fluent reader. Whenever he made another of his many mistakes, Marinus, his teacher, beat him on his left cheek. Finally it became too much for Romuald. "But, dear master," he said modestly, "hit me on the right cheek in the future. My left ear is almost deaf." The master was surprised at such patience and thereafter acted more considerately. The saint loved to say, "Better to pray one psalm with devotion and compunction than a hundred with distraction." When the holy man felt his end was near, he retired to the monastery at Val di Castro. After so many journeys he was eager to begin his final pilgrimage to an eternal resting place. Before the reform of the Calendar in 1969 his feast was celebrated on February 7, the anniversary of the translation of his relics in 1481. His feast is now June 19, the day he died in 1027. In the Calendar reform the Church has tried to move the feasts of the saints to their "birthday" — referring to the day on which the saint died and celebrated his/her birth into heaven. Often Portrayed as: Monk pointing at a ladder on which other monks are ascending to heaven indicative his founding of his Order. Read more about St. Romuald here. Spend some time reading the Psalms in silence as St. Romuald taught. "Sit in your cell as in paradise. Put the whole world behind you and forget it. Watch your thoughts like a good fisherman watching for fish. The path you must follow is in the Psalms—never leave it." Juliana was born in 1270 of the illustrious Florentine family of the Falconieri when her parents were already well advanced in years. Her uncle, the saintly Alexius Falconieri, declared to her mother that she had given birth "not to a girl but to an angel." At the age of fifteen she renounced her inheritance and was the first to receive from the hand of St. Philip Benizi the habit of a Mantellate nun. Many women followed her example; even her mother placed herself under Juliana's spiritual direction. St. Philip Benizi commended to her care and protection the Servite Order over which he had charge. So severe were her mortifications and fastings that a grave stomach ailment developed; she could take no food, not even the sacred Host. At the point of death she asked that a consecrated Host be placed against her heart. Then occurred a miracle — the Host vanished, and Juliana died with a radiant face. After her death the picture of the Crucified, as it had been on the sacred Host, was found impressed upon her breast. Patron: Bodily ills; sick people; sickness. Symbols: In the habit of the Servite Order with a Host upon her breast. These twin brothers died as martyrs at Milan about the year 170. They belong to the illustrious saints of the ancient Church. Little is known about their lives. The finding of their remains by St. Ambrose is well attested (386). St. Augustine, himself a witness, describes the event very dramatically in his Confessions (9, 7). St. Ambrose requested to be buried alongside the bodies of Sts. Gervase and Protase. In the year 1864 their relics were found under the high altar of the old Milan basilica in a sarcophagus of porphyry, and together with the remains of St. Ambrose were honorably re-entombed. Patron: Discovery of thieves; haymakers; Milan, Italy. Symbols: holding stones; with Saint Gervase; with his father and mother; youth holding a lead-tipped scourge in one hand and a sword in the other; youth holding the palm of martyrdom.